In this second part of this BLOG series, I’ll continue to discuss the concept of gratitude in the business realm, and once more remind all of our fundraiser for my dear friend Jon Atwater, who we are rallying to get walking again. “My colleagues Ye Li, Jennifer Lerner, Leah Dickens, and I decided to test how the experience of gratitude effects discounting and financial impatience. We designed an experiment (now in press at the journal Psychological Science) that presented participants with a set of 27 questions, which pit a desire for immediate cash against a willingness to wait for larger rewards at various times in the future. For example, one question required study subjects to choose between receiving $54 now or $80 in 30 days. To increase the stakes, participants knew they had a chance to obtain one of the financial rewards they had selected; it wasn’t purely hypothetical. If they chose the immediate cash, they’d be paid then and there; if they chose the delayed amount, we’d send them a check. However, before they made these decisions, we randomly assigned each one of them to recall and briefly write about an event from their past that made them feel (a) grateful, (b) happy, or (c) neutral. As we expected, individuals who wrote about neutral or happy times had a strong preference for immediate payouts. But those who’d described feeling grateful showed significantly more patience. They required an immediate $63, on average, to forgo receiving $85 in three months, whereas the neutral and happy groups required only $55, on average, to forgo the same future gain. Even more telling was the fact that any given participant’s degree of patience was directly related to the amount of gratitude he or she reported feeling. It’s important to note that positive feelings alone were not enough to enhance patience: Happy participants were just as impatient as those in the neutral condition. The influence of gratitude was quite specific. Things that make you go “Hmmmm.” I don’t know about you, but a study proving that accessing one’s gratitude memory can lead to long term success thinking, replete with supporting metrics (gracious people require $63 versus $55 now in order to forgo $85 in 90 days) represents serious reductionism. It appears that even gratitude must be studied, quantified and made into a practical success metric to be interesting in our rational – scientific post-modern culture. Our current culture must reduce “the good, character ethic and stages of consciousness” to observable behavior and its chemical correlate. Mainstream thought leaders don’t accept that the subjective reality of the human can be even more interesting than the synaptic interplay occurring in the brain. Let me be blunt – not one of the humans that I know and interact with daily (and most of them are highly educated and successful), required this study to know implicitly the power and import of gratitude. They understand that gratitude is an outgrowth of a daily striving for excellence. And yes, it leads to long term thinking and more success at all levels. But that is not because my friends are trying to be more grateful for success, playing off a tip they read. No, they experience gratitude because they strive to be better people every day. Just like you are. The experience of grace and gratitude is sacred. It shouldn’t really be sought as an end in itself, but it can be “practiced” as a means to an end – the end being a “good and just” person. It can also be good for business, but that occurs when we bring grace and gratitude into our workplace and practice sacred commerce. Once more, I ask you to consider an act of sacred commerce by supporting our online auction to help our teammate, Jon Atwater, walk again. Jon is a good friend, and my former Master Brewer at CBC, who broke his neck last summer. He needs our help or he will not have the funds for the physical therapy. No therapy means a very good chance the window of opportunity will shut on his ability to walk again. Please don’t take this as a pressured pitch from me – all I ask is for you to check out the generous items offered HERE up for the auction. If anything strikes you as worth bidding for, then go for it! I am grateful for your consideration and Jon will be even more grateful for the support. 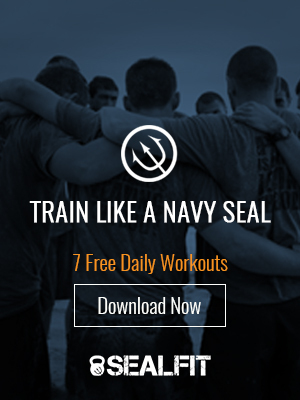 The entire SEALFIT – Unbeatable Mind tribe will be filled with that grace. A one day UM seminar with me (one on one or up to 20 people), a week or more stay to train at SEALFIT HQ, a private training session with Greg Amundson, an Oly Cert with the Burgeners, original artwork, and more! So if you can, please participate. My goal is to get Jon walking again and to engage the tribe in the act of service and attitude of gratitude. I would want someone to do the same for me and so would you. Remember…sometimes the lion does not roar!